BFREE is an ideal playground for the nature lover. Visitors to BFREE spend their free time exploring all the rainforest and field station have to offer. Birding and searching for other wildlife (both day and night) is a common past-time, as is taking a cool dip in the crystal clear Bladen River. 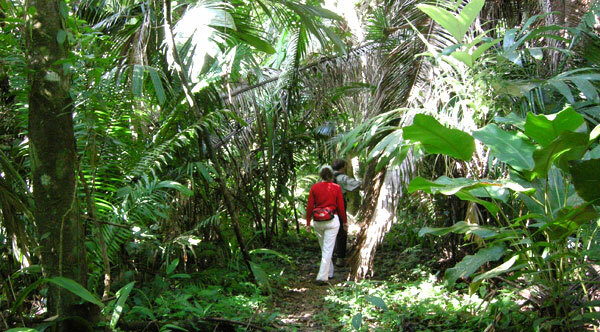 Hiking along trails that wind through the property and lead to habitats like the Agami Lagoon or the cacao agroforest immerse guests in the uniqueness of the reserve. Rich with flora and fauna, there is never a shortage of spectacular photo opportunities. 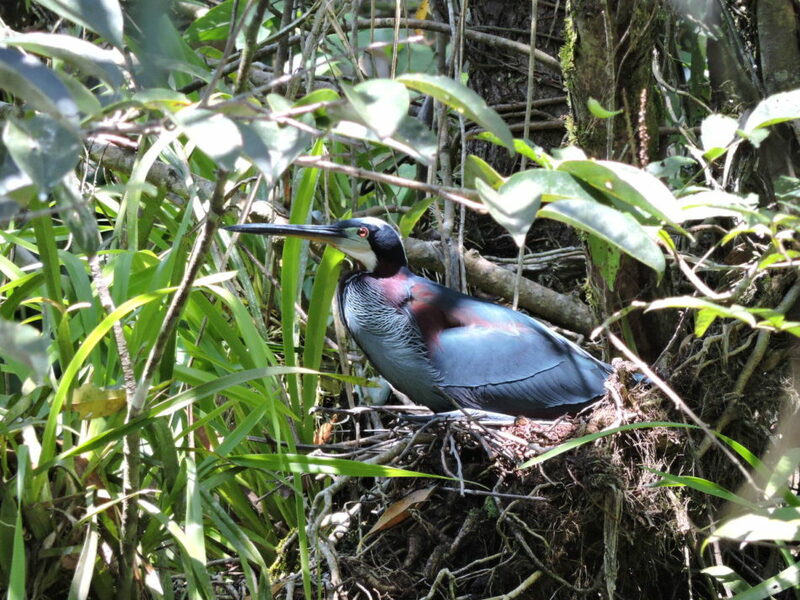 The Agami Lagoon is nesting habitat for both Agami and Boat-billed Herons. A bird blind situated along the edge of the lagoon minimizes visitors’ disturbance to wildlife. Visitors to BFREE enjoy recreational use of the Bladen River and spend time swimming, exploring, canoeing, and simply enjoying the breathtaking view. 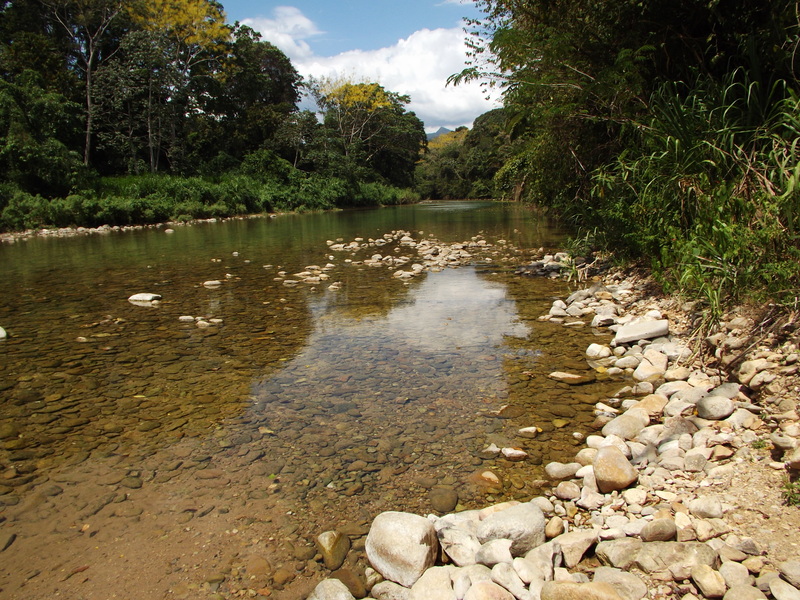 BFREE maintains an extensive network of trails into some truly spectacular rainforest and other tropical forest types. 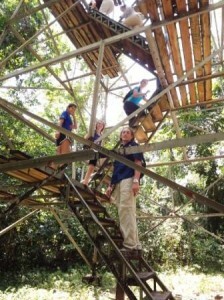 The Tower Trail takes hikers to the Observation Tower as it passes by the cacao project and a swamp Kaway forest. The Agami Lagoon Trail is about a 15 minute walk from the BFREE dining room and features a bird blind for viewing the rare agami and boat-billed herons. The Cacao Trail connects the Lagoon Trail to the Tower Trail as it winds through our cacao reforestation project. Because the understory has been thinned, it makes an excellent trail for wildlife viewing, especially at night! The Boundary Line Trail is the longest trail on BFREE property and runs indeed long the outer boundary line of BFREE’s 1,100 acres. This trail takes you across several streams and across wooden bridges winding up along the Bladen River south of the river crossing. Located about half a mile from the main compound, is a 112’ foot galvanized steel observation tower. The tower, a former US Forest Service fire tower, was purchased from the southeastern United States. BFREE staff traveled to south Georgia where they spent 5 days carefully and methodically disassembling the tower. Next it was shipped from Tampa, Florida to Belize then trucked down the Southern Highway, hauled back to BFREE and then hand carried to its carefully selected location about a 15 minute walk from the main compound of BFREE. Many volunteers and staff members worked together over the years to reconstruct the tower at BFREE; it was completed in December 2015.